I wasn’t looking for any kind of packaged spice mix when I went grocery shopping for ingredients to make chicken fajitas. I usually prefer to just use what I have in my spice drawer at home (which is pretty robust, by the way – one day I’ll post about it!). But I noticed a McCormick display promoting a new product with unusual packaging (see left). It was called Recipe Inspirations and it had six little pre-measured seasoning compartments (let me stress that I’m not being paid in any way to blog about this product). Coincidentally, one of these packets was for a marinade for Garlic Lime Chicken Fajitas. On the back of the packet they provide a little recipe card and – unlike most spice blends – they actually give you the measurements for each spice. I’m guessing their hope is that you’ll want to make the fajitas again, and next time you’ll buy full bottles of the seasonings. The former marketer in me finds that kind of brilliant. I didn’t need to buy pre-measured spices, but since the packets only cost a little over a buck I figured I’d pick one up and give their fajitas recipe a try. It was tasty! 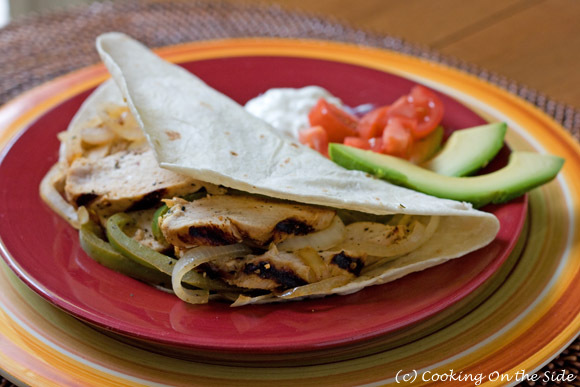 Fajitas are kind of a go-to weeknight meal in our house, we have them pretty often. I’m a fan of citrus-marinated chicken, so the lime and orange juices in this recipe really worked for me. I normally would have made fajitas with fresh garlic and cilantro, but the dried seasoning approach wasn’t bad either. And it definitely was a timesaver. Mix juices, oil, all of the spices and salt in a small bowl. Reserve 1/4 cup of the marinade. Place chicken in large resealable plastic bag or glass dish. Add remaining marinade; turn to coat well. Refrigerate 30 minutes or longer for extra flavor. 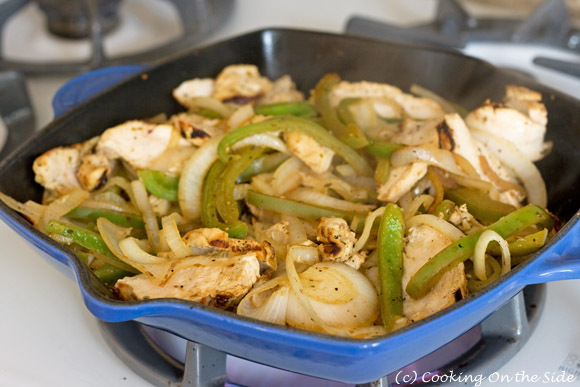 Spoon chicken mixture into warmed tortillas. Serve with assorted toppings, if desired. * I opted to grill my chicken first before cutting into strips – it’s up to you. I saw this same package in the supermarket last week and thought, gee, who would buy this? Especially since I have all of these spices (or the fresh equivalents) on my spice rack all the time? But as a way to introduce people to something new, it’s a pretty creative idea. And now we know the recipe works! Very cool! I was wondering how these were! Thanks! thank you for posting the recipe. i tried it and it went over very well with hubby and the boys (2 & 3). i purchased it as a study on how to season food. it was a great marketing trick, and since i had actually just had a car accident and was at the store without a list and no meal ideas — it worked. Thanks so much for posting the ingredient amounts. I cannot find my recipe card so this was a huge help!! Thank you for posting this!! I saw these packages in my grocers spice isle. I knew I had all these ingredients at home & didn’t need to spend the money on the actual kit. I googled the packets name, found the measurements and made a GREAT dinner!!! I happened to pick this up today at the store, made them, and enjoyed them! Just turned on the computer to print out the recipe and found your blog. Since I didn’t cook all the marinated chicken, I’m going to freeze a single portion(marinated meat, veggies, and tortillas in separate sandwich ziploc bags, but altogether in a freezer ziploc bag) and include the cooking instructions. Hoping for an easy single-serving meal! Thanks for posting this. I am going to make these to go with a Mayan chocolate cake recipie from the website, Baking Outside The Box, for my new husband for Valentines day. I need to keep it simple as he is the main chef in thehouse!